^ a b c d ﻿PubMedHealth - Common colds: Overview﻿ (Report). アメリカ国立医学図書館. (2014-04-23). http://www.ncbi.nlm.nih.gov/pubmedhealth/PMH0072727/. ^ a b c Arroll, B (March 2011). “Common cold”. Clinical evidence 2011 (3): 1510. PMC 3275147. PMID 21406124. https://www.ncbi.nlm.nih.gov/pmc/articles/PMC3275147/. "Common colds are defined as upper respiratory tract infections that affect the predominantly nasal part of the respiratory mucosa"
^ a b c Allan, GM; Arroll, B (18 February 2014). “Prevention and treatment of the common cold: making sense of the evidence.”. CMAJ : Canadian Medical Association 186 (3): 190–9. doi:10.1503/cmaj.121442. PMC 3928210. PMID 24468694. https://www.ncbi.nlm.nih.gov/pmc/articles/PMC3928210/. ^ a b Eccles R (November 2005). “Understanding the symptoms of the common cold and influenza”. Lancet Infect Dis 5 (11): 718–25. doi:10.1016/S1473-3099(05)70270-X. PMID 16253889. ^ “The common cold”. Lancet 361 (9351): 51–9. (January 2003). doi:10.1016/S0140-6736(03)12162-9. PMID 12517470. ^ Eccles 2009, p. 209. ^ Kim, SY; Chang, YJ; Cho, HM; Hwang, YW; Moon, YS (21 September 2015). “Non-steroidal anti-inflammatory drugs for the common cold.”. The Cochrane database of systematic reviews 9: CD006362. doi:10.1002/14651858.CD006362.pub4. PMID 26387658. ^ a b c d e f g h i Fashner J, Ericson K, Werner S (2012). “Treatment of the common cold in children and adults”. Am Fam Physician 86 (2): 153–9. PMID 22962927. http://www.aafp.org/afp/2012/0715/p153.html. ^ Harris, AM; Hicks, LA; Qaseem, A; High Value Care Task Force of the American College of Physicians and for the Centers for Disease Control and, Prevention (19 January 2016). “Appropriate Antibiotic Use for Acute Respiratory Tract Infection in Adults: Advice for High-Value Care From the American College of Physicians and the Centers for Disease Control and Prevention.”. Annals of Internal Medicine. doi:10.7326/M15-1840. PMID 26785402. ^ a b c d e f ﻿Is It a Cold or the Flu?﻿ (Report). アメリカ国立アレルギー感染症研究所. (2015-04). 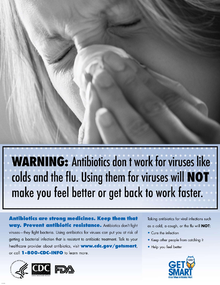 https://www.niaid.nih.gov/media/it-cold-or-flu. ^ a b Ran L, Zhao W, Wang J, et al. (2018). “Extra Dose of Vitamin C Based on a Daily Supplementation Shortens the Common Cold: A Meta-Analysis of 9 Randomized Controlled Trials”. Biomed Res Int: 1837634. doi:10.1155/2018/1837634. PMC 6057395. PMID 30069463. https://doi.org/10.1155/2018/1837634. ^ “Sequencing and Analyses of All Known Human Rhinovirus Genomes Reveals Structure and Evolution”. Science 324 (5923): 55–9. (2009). doi:10.1126/science.1165557. PMC 3923423. PMID 19213880. https://www.ncbi.nlm.nih.gov/pmc/articles/PMC3923423/. ^ Eccles 2009, p. 77. ^ Pelczar (2010). Microbiology: Application Based Approach. p. 656. ISBN 978-0-07-015147-5. https://books.google.com/books?id=xnClBCuo71IC&pg=PA656. ^ medicine, s cecil. Goldman (24th ed.). Philadelphia: Elsevier Saunders. p. 2103. ISBN 978-1-4377-2788-3. https://books.google.com/books?id=Qd-vvNh0ee0C&pg=PA2103. ^ a b c d Allan GM, Arroll B (February 2014). “Prevention and treatment of the common cold: making sense of the evidence”. CMAJ (3): 190–9. doi:10.1503/cmaj.121442. PMC 3928210. PMID 24468694. https://doi.org/10.1503%2Fcmaj.121442. ^ Johnston CS, Barkyoumb GM, Schumacher SS (July 2014). “Vitamin C supplementation slightly improves physical activity levels and reduces cold incidence in men with marginal vitamin C status: a randomized controlled trial”. Nutrients (7): 2572–83. doi:10.3390/nu6072572. PMC 4113757. PMID 25010554. https://doi.org/10.3390/nu6072572. ^ Cohen S, Doyle WJ, Alper CM, Janicki-Deverts D, Turner RB (January 2009). “Sleep habits and susceptibility to the common cold”. Arch. Intern. Med. (1): 62–7. doi:10.1001/archinternmed.2008.505. PMC 2629403. PMID 19139325. https://www.ncbi.nlm.nih.gov/pmc/articles/PMC2629403/. ^ Prather AA, Janicki-Deverts D, Hall MH, Cohen S (September 2015). “Behaviorally Assessed Sleep and Susceptibility to the Common Cold”. Sleep (9): 1353–9. doi:10.5665/sleep.4968. PMC 4531403. PMID 26118561. https://www.ncbi.nlm.nih.gov/pmc/articles/PMC4531403/. ^ Wilder-Smith A, Mustafa FB, Earnest A, Gen L, Macary PA (October 2013). “Impact of partial sleep deprivation on immune markers”. Sleep Med. (10): 1031–4. doi:10.1016/j.sleep.2013.07.001. PMID 23993876. ^ Cohen S, Doyle WJ, Turner R, Alper CM, Skoner DP (September 2003). “Sociability and susceptibility to the common cold”. Psychol Sci (5): 389–95. doi:10.1111/1467-9280.01452. PMID 12930466. ^ Cohen S, Janicki-Deverts D, Doyle WJ (2015). “Self-Rated Health in Healthy Adults and Susceptibility to the Common Cold”. Psychosom Med (9): 959–68. doi:10.1097/PSY.0000000000000232. PMC 4643389. PMID 26397938. https://www.ncbi.nlm.nih.gov/pmc/articles/pmid/26397938/. ^ Sneed RS, Cohen S, Turner RB, Doyle WJ (2012). “Parenthood and host resistance to the common cold”. Psychosom Med (6): 567–73. doi:10.1097/PSY.0b013e31825941ff. PMC 3746028. PMID 22773866. https://www.ncbi.nlm.nih.gov/pmc/articles/PMC3746028/. ^ Cohen S, Alper CM, Doyle WJ, Treanor JJ, Turner RB (2006). “Positive emotional style predicts resistance to illness after experimental exposure to rhinovirus or influenza a virus”. Psychosom Med (6): 809–15. doi:10.1097/01.psy.0000245867.92364.3c. PMID 17101814. ^ Rakel DP, Hoeft TJ, Barrett BP, Chewning BA, Craig BM, Niu M (2009). “Practitioner empathy and the duration of the common cold”. Fam Med (7): 494–501. PMC 2720820. PMID 19582635. https://www.ncbi.nlm.nih.gov/pmc/articles/pmid/19582635/. ^ Rakel D, Barrett B, Zhang Z, et al. (December 2011). “Perception of empathy in the therapeutic encounter: effects on the common cold”. Patient Educ Couns (3): 390–7. doi:10.1016/j.pec.2011.01.009. PMC 3107395. PMID 21300514. https://www.ncbi.nlm.nih.gov/pmc/articles/pmid/21300514/. ^ a b c d 大塚恭男 1996, p. 176. ^ 大塚恭男 1996, p. 158. ^ a b c 大塚恭男 1996, p. 159. ^ a b c 大塚恭男 1996, p. 160. ^ Arroll B, Kenealy T (2005). Arroll, Bruce. ed. “Antibiotics for the common cold and acute purulent rhinitis”. Cochrane Database Syst Rev (3): CD000247. doi:10.1002/14651858.CD000247.pub2. PMID 16034850. ^ ﻿CG69: Respiratory tract infections (self-limiting): prescribing antibiotics﻿ (Report). 英国国立医療技術評価機構. (2008-07). https://www.nice.org.uk/guidance/cg69/. ^ Simasek M, Blandino DA (2007). “Treatment of the common cold”. American Family Physician 75 (4): 515–20. PMID 17323712. http://www.aafp.org/afp/20070215/515.html. ^ Eccles 2009, p. 218. ^ G Goto M, Kawamura T, Shimbo T, Takahashi O, Ando M, Miyaki K, Nohara T, Watanabe H, Suzuki I, Aono M (2007). “Influence of loxoprofen use on recovery from naturally acquired upper respiratory tract infections: a randomized controlled trial”. Intern. Med. 46 (15): 1179–86. PMID 17675766. ^ Maggini S, Beveridge S, Suter M (2012). “A combination of high-dose vitamin C plus zinc for the common cold”. J. Int. Med. Res. (1): 28–42. doi:10.1177/147323001204000104. PMID 22429343. ^ Singh M, Singh M, Jaiswal N, Chauhan A (August 2017). “Heated, humidified air for the common cold”. Cochrane Database Syst Re: CD001728. doi:10.1002/14651858.CD001728.pub6. PMID 28849871. https://www.cochranelibrary.com/cdsr/doi/10.1002/14651858.CD001728.pub5/full. 玉置淳. ﻿急性上気道感染症 治療法ガイドライン﻿ (Report). 特定非営利活動法人 標準医療情報センター. http://www.ebm.jp/disease/breath/01jokido/guide.html.